It is interesting to look at a city like Alba Iulia which is not only a part of Transylvania, but is the heart of the Romanian people in the area, but also because it has so much history and so many stories it is important to the Romanian people and there are many people who are buried in the city who profoundly impacted life in Transylvania. There are churches, historic sites, and people from monks (Alexandru Borza- born there, but died in the city of Cluj) to sculptures (Rudolf Zullich- born there) had their beginnings in this city. The city boasts a proud and colourful history, it has been home to coronations, and to peace treaties. 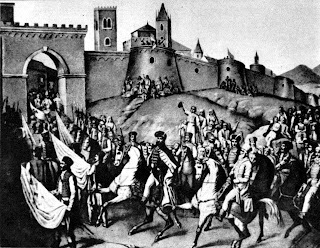 This picture shows the entrance into the city by Michael the Brave, Prince of Wallachia and Moldavia, and soon to be Prince of Transylvania in 1599. He was murdered less than a year later. King Ferdinand of Romania was crowned in Alba Iulia along with his wife, the famous Queen Maria, in 1922. In October 2012, on the 90th anniversary, Crown Princess Margarita of Romania will be in the city to commemorate this historic event. In an interesting twist, Isabella Jaiellon who was queen consort of "Eastern Hungarian Kingdom" would be the person who is linked to the British royal Family, and she is buried in Alba Iulia. She has within her descendants the British Royal Family, and because of this the Prince of Wales owns property in Transylvania. Alba Iulia is one of the main cities that a tourist should visit in Transylvania; it shows the land in a different way and shows what the people of Transylvania live with. They have a historic centre but also a very vibrant modern way of life. It was the 'melting pot' of peoples: Saxons, Hungarians, Romanians, Jews and others lived and worked in this city. While there are no natural resources within the city, however, there a long history of the worth of the natural resources in the surrounding area. The Roman Empire would create this city due the the location of gold deposits close to it.